that of any other rocky planet in our solar system and a surprisingly dynamic history. Using observations from NASA’s Messenger spacecraft in orbit around Mercury, researchers have found that the planet’s huge iron core is even larger than they had thought, and it’s likely overlain with a solid shell of iron and sulfur, a layered structure not known to exist on Earth, Venus or Mars. According to researchers there’s more Mercury appears to have remained geologically active for a surprisingly large chunk of its evolutionary history. Messenger (MErcury Surface, Space ENvironment, GEochemistry and Ranging) spacecraft launched in 2004. It then took a circuitous route to the solar system’s innermost planet, becoming the first probe ever to orbit Mercury in March 2011. The probe is mapping Mercury’s surface and gathering data on the planet’s composition, magnetic environment and tenuous atmosphere, among other features. To date, Messenger has taken nearly 100,000 images and made more than 4 million measurements of the planet’s surface. The two new studies detail findings that should help scientists better understand Mercury’s murky past. In one study, researchers used observations made by Messenger’s laser altimeter to map the topography of Mercury’s northern hemisphere. They found that the range of elevations was smaller than that found on either Mars or the moon. 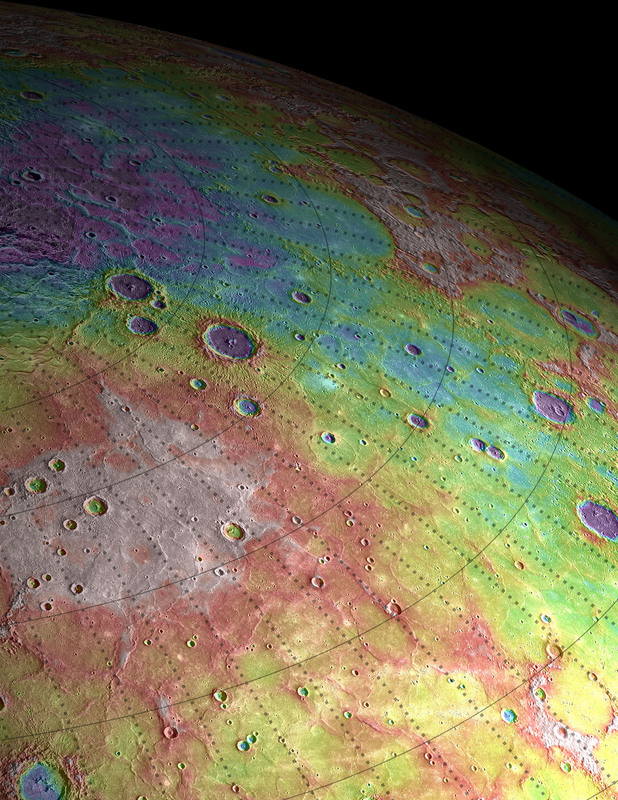 Messenger also observed that the floors of many Mercury craters have been tilted substantially. Part of the floor of the Caloris basin, at 960 miles (1,550 km) across one of the largest impact features in the solar system, has even been raised above its rim. These discoveries suggest that internal forces pushed the craters up after the impacts created them, providing strong evidence that Mercury remained geologically active long after its formation. Researchers also estimated Mercury’s gravity field by precisely radio-tracking Messenger’s movements around the planet.They determined that Mercury has mascons, large positive gravity anomalies associated with big impact basins . The team’s gravity calculations also suggest that Mercury has an iron core that comprises roughly 85 percent of the planet’s radius.The new findings should help shed light on Mercury’s past, and on the formation and evolution of rocky planets in general.